They will have to fly it alone. The San Bernardino flying squirrel does not require protection under the Endangered Species Act, announced the U.S. Fish and Wildlife Service recently. The USFW conducted a status review for this small tree-dwelling mammal that lives in the forest canopies of the San Bernardino Mountains; they determined that the flyer has sufficient numbers where it’s current found and that threats of habit loss, urban development, wildlife, air pollution and climate change do not pose significant threats to its long-term survival. 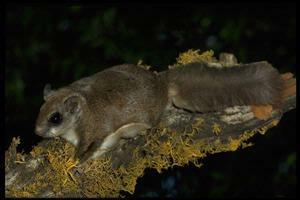 One of 25 subspecies of the northern flying squirrel, the San Bernardino flyer feeds on truffles, insects, bird eggs, pinyon pine seeds and other vegetation. And yes, they don’t *really* fly – they get their names from a furred membrane (“patagium”) that extends from their wrists to ankles which allows the squirrels to glide gracefully between trees. At one time, flying squirrels were documented in both the San Bernardino and San Jacinto Mountains; however, they are only found today in the San Bernardino range.